When you were a kid, did you ever have a favorite toy or game that you played all the time, it was always available, you loved it, but then you tired of that toy or game? You went on to look for different toys, more sophisticated toys and games that made you feel differently, maybe more intelligent. You still loved the old toy, but it got relegated to the status of “Old Standby”? For me it was my old “Verty Bird” helicopter rescue game. This toy was simple. It had two joysticks, one that controlled the elevation of the helicopter, and one that controlled both speed and direction. The helicopter was tethered to a base, so it just went around in circles, but it gave me hour upon hour of enjoyment, trying to pick up the people in the life rafts and carry them to safety on the other side of the circle. I remember two things about this toy most. I used it so much I had to get another, as I wore out the first one, and my mother was never so happy with the advent of alkaline batteries, because the 4 D batteries this thing took were cutting into the family’s food budget. A couple of years ago I was at a garage sale, and sitting right there, in the box, was an old Verty Bird Helicopter. I had to have it. I brought it home and set it up and played with it for hours. I rekindled my love affair with this old toy, and introduced my kids to it as I would have an old college room mate. So what does this have to do with beer? Well the other day I got a hankering for a beer. Nothing too big, or special, just a nice light easy drinking beer so I could have a couple. I didn’t have anything that fit that description in the house. It was about 10:30pm, and in my small town all the grocery store options had long been closed. My choice was to go to the local bar and hope nobody saw me so I didn’t have to stay and gab (not likely to happen in a town of 1000 people) or run to the Chevron station C Store. C store it was. They had door upon door of light, lagery, watery brews and then about half a door of things that were a little more crafty. 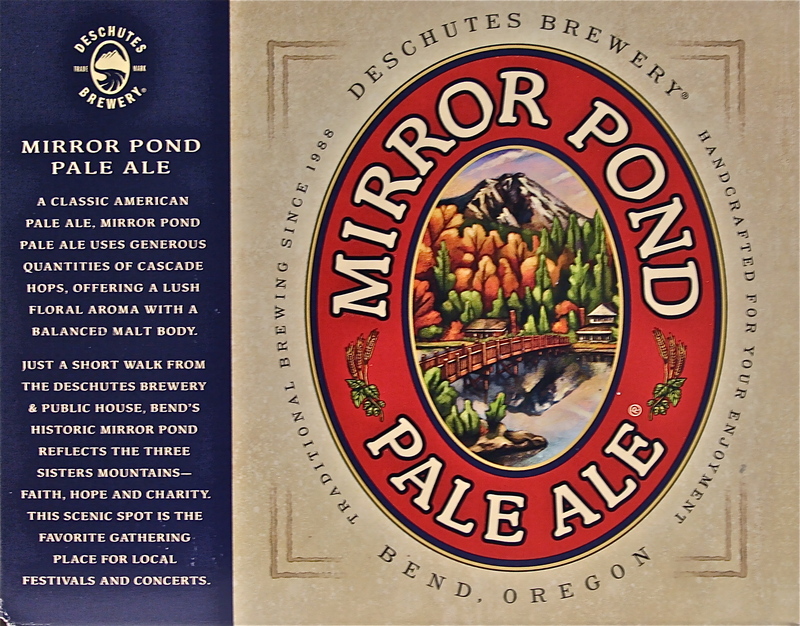 There I saw and purchased a six pack of Deschutes Mirror Pond Pale Ale. I was actually a little disgruntled at my purchase because they were out of Sierra Nevada Pale Ale (my typical go to) and they didn’t have any of the Red Chair, a Deschutes IPA that would have been perfect for this occasion. So I got home, and didn’t even wait to go in the house to crack one open, such was my cravings for a cold beer. No, I popped the top and drank it right out of the bottle sitting in my car in my driveway while I listened to something about Aliens on AM Coast To Coast. Now I had drank Mirror Pond dozens of times before, but truthfully it had probably been about 5 years since I’d had one. I had forgotten about the biscuity malt backbone of this beer, and how that hoppy citrusy tang right in the middle married so well with the maltiness of the beer. I had forgotten how refreshing it was on a hot summer night, I had forgotten how absolutely well crafted this little pale ale was, and it was in front of me all the time! Every where I go its looking right at me, and every other time I just passed it right by. Like catching up with an old friend, this beer made me smile. Like an old toy, rediscovered, I will never take Deschutes Mirror Pond Pale Ale for granted again. I’ve been enjoying the sixer all along, I’ve drank a few, and Sunday I made beer can chicken with one, and it was outstanding! If you see this old standby, now new favorite of mine out there, pick it up. It won’t disappoint. What about you? What was your favorite toy? Have you ever had the joy of rediscovering an old friend? Let me know in the comments. I thoroughly enjoyed Legos as a kid. Loved those things. Same sort of thing happened to Jim. He used to like one of the Saranac beers early in his early beer geekdom. He now hates them pretty much across the board. Too bad. Try the Lienies Summer Shandy, it goes great in the Dells. Lately I’ve been back and forth between Full Sail’s Pale Ale and Amber Ale from Hood River, OR. Will have to give Deschutes Pale a try as well. I never really got into Full Sail’s stuff, except for their Black Gold which is a bourbon infused and aged stout. That stuff is amazing! My little brother just recently moved to Idaho from Michigan and we shared some Mirror Pond the first night he came over. His jaw about hit the floor when he saw the 12-pack of Deschutes on sale at the grocery store for a little over $12. Beer’s not so cheap in Michigan. Most craft six packs start at $9-10 there. My “old standby” would have to be Oberon. I don’t think I could drink it as often as I used to, but when I get the chance to enjoy a couple each summer, it’s always pretty nice. I paid $8 for the six pack. But that was at a C-Store. I think it is about $7.50 in the grocery store, and probably around $12.99 for a 12 pack. Yeah, beer prices are pretty good here, just selection is pretty limited. I like Mirror Pond, but it’s double strength brother makes me really smile. I know they haven’t made it since 2009, but Mirror Mirror is simply my favorite beer. If you have any influence with Deschutes, beg them for me to make this again. Mirror Mirror is an acquired taste that some beer geeks love, while many, like me, find the resinous cloying sweetness too difficult to process. I don’t think I would ever buy this beer again, and I really haven’t missed it. For you Oliver I hope they bring it back. They typically only brew it every other year, so I’m not sure it is gone forever, but probably just giving it a rest for now. Being an old fart, we didn’t have all the gee-whiz–bang-em-up toys during the pre-TV age. I’d be torn between a real solid metal truck that I could actually sit on and an erector set. As for beer, that’s hard, as I usually drank whiskey–Irish or Bourbon–back then. But if I had to pick a cold one from the Way-Back-Machine, I’d say Genesee Pale Ale. Pretty tame by today’s craft/micro standards, but for a post-prohibition American-made beer it tasted pretty damn good. Just picked up a Genesee at my local grocery. Honestly I’ve heard nothing but bad things about this beer, but it is brewed by the country’s oldest continuously operating brewery, so for nostalgia sake I thought I would give it a try. It also comes in a 24 oz can…classy! I grew up outside of Rochester NY & Genesee had a malt house at Sodus Point. Since it was a local beer, it was a local favorite. The beer was fine, but their Cream Ale was my favorite, more flavor. The 20 Horse Ale was nice change up as well. But after a 28 yr sabbatical, it just taste as I remember it. But with new owners & master brewers, maybe it did change. Or has my initial sampling of craft beers evolved my beer tastes? Living in Oregon, Mirror Pond has never gone away for me. Has been and always will be my standby. Slight nit-pick: Red Chair is not an IPA. Labeled a “Northwest Pale Ale,” by Deschutes. Nowhere near the hoppiness of an IPA. It is clearly a Mirror Pond sibling, but definitely not a twin. To be fair, the original Bond Street version of Red Chair was an IPA. The current NW Pale Ale is their basic spring seasonal. Probably good you didn’t see it on the shelf. May have been getting a bit long in the tooth. Oh how I wish Red Chair was available year-round. I’ve been known to hoard it when they stop brewing it for the year, but it never lasts long. I even sent a bottle to a friend of mine in NZ for her to review on her blog! Mirror Pond does the trick nicely though. Especially with that nice Cascade kick you get on the nose! Red Chair is a delightful beer, and one I just discovered this year. As much as I travel to the South, I have a bit of a crush on the Sweetwater brews…a summer fave is the Sweetwater Blue. Heavy blueberry flavor, slight hops…goes down like sweet tea! I’ve heard really good things about this brewery (their website notwithstanding). The Blue sounds fantastic. Right up my alley, as is anything with blueberries in it. As for their website, nevermind. I just checked it, and it looks like they got someone who knew what the hell they were doing to redesign the thing. OMG Don, after reading the first 5 words of your post I immediatly knew which toy you were going to mention. The Verty Bird! You were nice enough to let me play sometimes too and the hours we spent flying that helicopter in circles trying to pick up the “load” below. What great memories. Do you remember the wood burning kit? Melting carpet comes to mind……. When I think of the wood burning kit I think of blistered fingers, not burned carpet. I think I might have gotten the blistered fingers trying to remove said melted carpet from the tip of the kit. Can you believe what they used to market to kids? That reminds me, I think I’ll go hurl some lawn Jarts in the general direction of my kids tonight. Beautifully written memories of that Verti-Bird Don, well done. I had the same toy and experienced the same mass consumption of those old alkaline batteries, which leaked and stained the carpet permanently. My father’s solution was a trip to Radio Shack which included a lesson on electric conversion from 110 to 12 volt with a transformer (more accurately rectifier). I have to imagine it sparked my interest in aviation which led to flying in the Air Force, which stationed me in England, which introduced me to craft beer. This was the place where I was exposed to the concept of a ‘Pub’, where alcohol is not treated with the same Victorian disdain experienced in the US. Kinda weird considering Queen Victoria was from England, but the royal family avoids stupid beer laws where we go out of our way to create them. Like limiting the number of bars so there isn’t one on every block like England. That way we have to drive to the nearest tavern, pure genius. The brew-pub was already long established with names like the ‘Fox and Firkin’ with small batch brews where the distribution channel was the publican/brew master. They had a slogan which was “For Fox sake, get me a Firkin pint!” Don’t know how well that translates into American, but it was apropos. On occasion, when I have an English beer, I recall my years in Jolly ol’ England, the pubs and that awesome little toy helicopter. Glad I was able to evoke such strong memories for you. I have to imagine those soldiers that fly drones now were hooked on flying simulation games on their home PC before entering the service. I simply wish we had no beer laws at all in this country. But when BMC control the political chambers they are always trying to gain an advantage through legal wrangling, because they know their product is inferior.